Of course there are nayasyers (NYT's Room for Debate below has several points of view), but really this is a low-cost (about $200), potentially high-yield project in terms of both actual food and national attention to the crisis of unhealthy eating and unhealthy land-use. It send a message of how to think differently about food and better ways to use your grassy lawn. 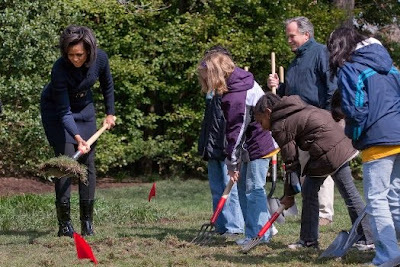 The White House garden represents a simple step, but it's a great way to engage kids to think about better food choices. It shows kids and adults that growing food is like magic, but not a mystery. Even just knowing that local food is possible, even in the most unlikely places, is important and empowering. As the community gardeners say, "You grow girl!"